TranSlice: Info from Pixel Film Studios brings back split screen transitions with a new style. TranSlice: Info allows Final Cut Pro X users to transition from clip to clip using clean sliding photos to reveal their split-screen. 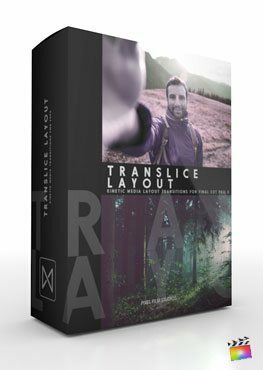 With over 54 customizable presets, users can create endless animated transitions without ever having to set a keyframe in FCPX. TranSlice: Info requires FCPX version 10.2 or newer. TranSlice: Info brings back the split screen transition back with another unique style. Final Cut Pro X users can now transition from one screen to the next with clean sliding panel. TranSlice: Info gives FCPX users over 50 customizable animation presets to make each transition unique. With every panel orientation and direction covered, no transition will look like the next! Where do I find TranSlice: Info? Once the installation is complete, you can find TranSlice: Info in the FCPX Transition library.